My love story with durian didn’t start off so passionately from the beginning … I was warned that one either loves it or hates it. Still, the rule is this: you have to try it three times before you can be sure of your feelings toward it. At first I found the smell to be a bit disgusting (just to have an idea, some people describe as “the smell of a very dirty toilet”) and the taste not so special. But as I gave it more chances I finally fell in love with it. I observed with surprise how my senses changed their perception: the smell is one of the best, delicate and distinct perfumes in the world, the consistency and taste are comparable to one of the most delicious artisan Italian gelato you could find out there! And yes, it is all natural! And it doesn’t stop here! Durian is highly nutritious and it is even used as a medicine (fruit, leaves and roots). Durian fruit is high on natural sugar, Vitamin C, potassium, being a complete source of carbohydrates, proteins and fats. Some raw foodies recommend it as a good source of raw fats. In the same time it is considered a high glycemic food and consumption should be limited. Moreover, one interesting side effect of over indulging in durian fruit is getting exaggerated hangover symptoms! In the same time, if you choose to consume durian, don’t eat it mixed with alcohol or coffee, as it will acutely slow down your digestion. 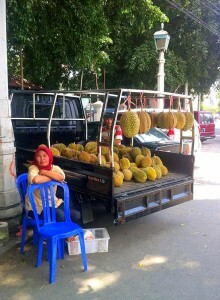 Nevertheless, Javanese people here believe that the durian has aphrodisiac qualities. The Durian fruit is quite expensive for the average Indonesian, one of the reason being the challenge to pick it: it is heavy, having sharp thorns on all its surface (actually the name itself comes from duri,the word for thorn in Malay language) and it can just fall off from several meters high! Interestingly enough, it’s been observed that most mature fruits fall by themselves during night time, as if the intelligent nature programmed it like this so it would avoid hurting any people. There is even an Indonesian saying about the durian fruit that confirms its value: ketiban durian runtuh = getting a durian avalanche or in other words getting an unexpected fortune. 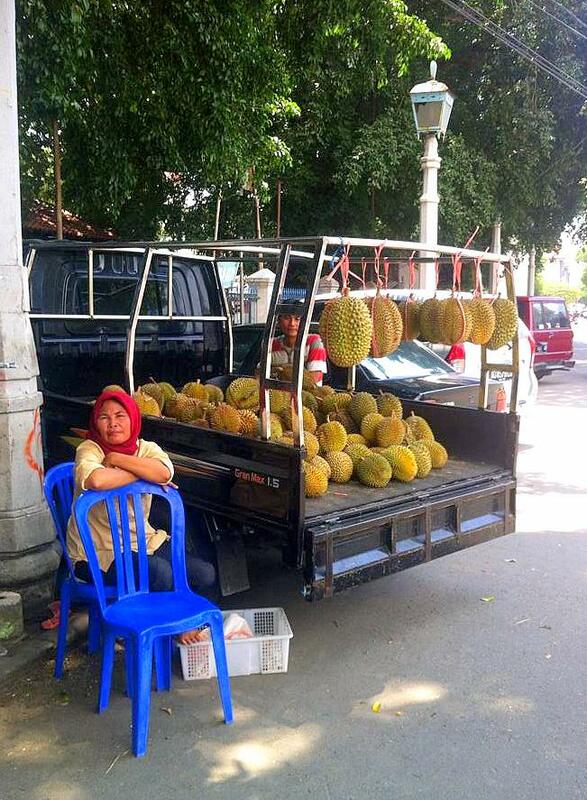 There are about 6 edible Durian varieties to be found in South and South-East Asia and picking a delicious ripe fruit from the stall in the pasar (local market) requires a high level of mastery. In conclusion: the durian fruit is the proof that God exists and that She loves us! ← Happy new year of the Wooden Sheep! Selamat tahun baru imlek! Gong Xi Fa Cai! Ah, durian! One of my favourite fruits since my childhood.